Training in New York at Richard Amos' Dojo. 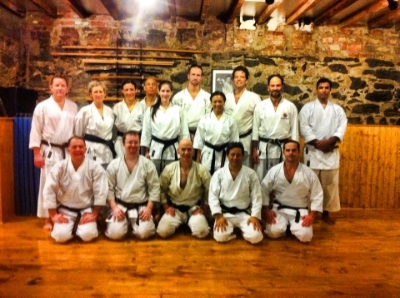 We look forward to welcoming Sensei Amos, 2nd from right in the back row, sometime. I am delighted that you are interested in training with Los Angeles Shotokan Karate (“LASK”). LASK just started up and we are meeting initially at 1450 2nd Street, Santa Monica, CA and jogging down to a grassy area on the promenade or beach. Classes will be by the following schedule: Monday through Friday, 4pm to 5:30 pm. As students arrive and weigh in on evening hours we will find an inside venue at the best times we can manage for our students. I started the school because I myself wanted to train in a more integrated and natural fashion, of course, with the proper deference to the ettique and collective wisdom of Karate. Also, I want to get a great workout on a daily basis. My hope is that we can draw in great students and some other teachers to provide an authentic, but also eclectic experience for our students. Both of my favorite instructors are really good about incorporating ideas while staying true to the soul of Karate. Students have the chance to progress in “Kyu” and “Dan” (colored and black belt) rankings if they want. We will have testing from World Traditional Karate Organization, www.wtko.org. Dues are by donation only. I will try to save up enough money to get a very senior instructor for testing and events. All are welcome to train regardless of their financial circumstances. I look forward to training with you and improving along with you. Please contact me if you have any questions, and, again, confirm class the day before. Osu! (A word which means basically everything in karate). Avi Rokah is a great local talent. We hope he will join us to teach and train!